Potentilla tridentata of Michigan Flora. Open sandy ground, such as old dune ridges and glacial outwash plains; dry savanna of jack pine and oak; rock shores, outcrops, and summits. Locally abundant along Lake Superior from Whitefish Point west ward, typically with scattered jack pine, blueberries and other ericads, Avenella flexuosa, and Hudsonia tomentosa but thriving in mowed lawns (as at Coast Guard installations); reappearing in the jack pine plains of the northern Lower Peninsula. 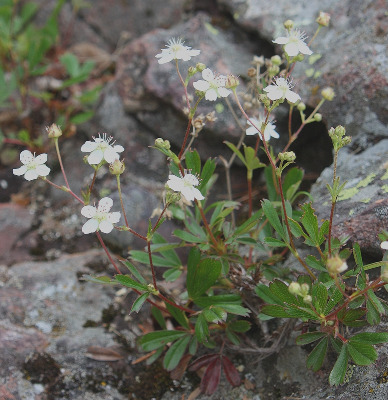 The Emmet Co. record is based on plants presumably adventive along a railroad in 1920. MICHIGAN FLORA ONLINE. A. A. Reznicek, E. G. Voss, & B. S. Walters. February 2011. University of Michigan. Web. 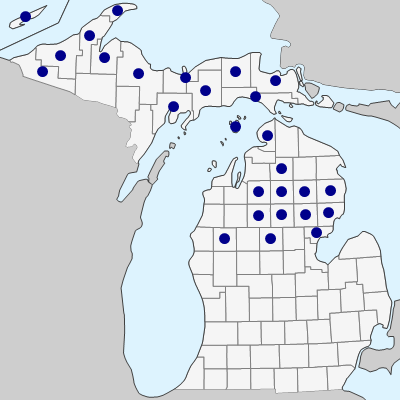 April 21, 2019. https://michiganflora.net/species.aspx?id=2514.